The different colours on a 3D-printed hand help students to differentiate the body part’s intricate layers. The heart has a complex network of veins, arteries and valves that overlap and intertwine with each other, making it difficult for medicine student Muhammad Nasrullah Bin Shahrir, 21, to study it using two-dimensional images in textbooks and videos. “It’s quite hard to memorise the different parts and pathways when you can’t see where they go,” said the first-year student from the Lee Kong Chian School of Medicine (LKCMedicine). But now, with the help of a 3D-printed heart model, Nasrullah can hold the recreated organ in his hand and examine it more closely. 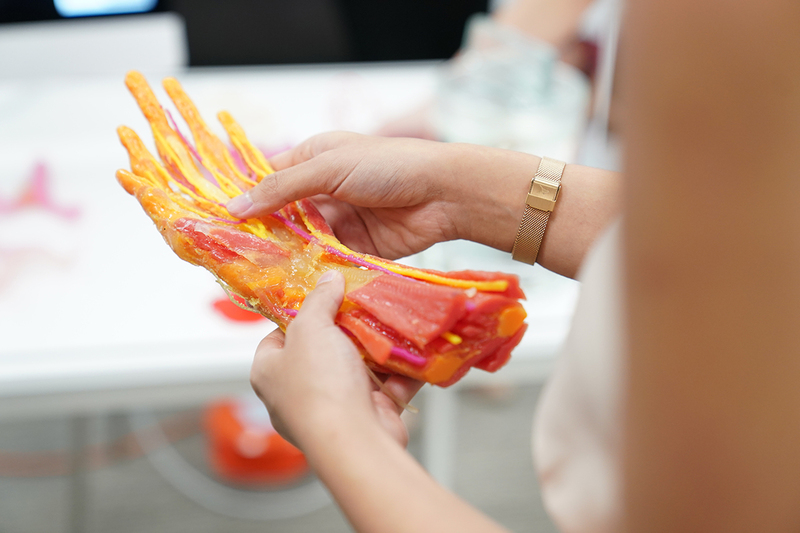 Last October, LKCMedicine collaborated with NTU’s Singapore Centre for 3D Printing to produce 20 anatomy models, which include hearts, hands, elbows, knees and airways, in a move to make the hands-on study of human anatomy in Singapore more accessible. Human anatomy has traditionally been studied across universities in Singapore using actual cadavers and preserved or embalmed organs, which have to be kept in jars or hardened in plastic. The use of 3D-printed models in medical schools is a first in Singapore. These models are set to allow medicine students like Nasrullah to better visualise the human anatomy. The models were made by scanning donated organs from deceased patients, and then recreating them using plastics of various hardness and colours. A set of upper and lower limbs will be added to the medicine school’s collection this April. The 3D models will provide students with more opportunities to handle, examine and inspect organs, said the school’s head of anatomy, Assistant Professor Sreenivasulu Reddy Mogali. “For example, students can feel how a hollow blood vessel feels different from the more dense heart muscle,” he said. The models also contain different layers and colours, which help students to better visualise the structure of the organs and differentiate intricate layers from each other, he added. Phua Wei Yuan, a second-year LKCMedicine student, said that having such specimens to feel and examine has made it easier for him to visualise how a body part works. “Currently, we can only see preserved specimens of diseased organs. They're kept in jars in liquid and it's hard to imagine how it fits into the body,” said the 22-year-old. Other students are looking forward to practicing procedures on the models, such as giving injections or placing catheters. Ryan Chor, a second-year LKCMedicine student, said this could help him to learn without the pressure of making mistakes. “It’s very embarrassing to learn how to draw blood from a real patient and make mistakes. With the models, we can afford to learn better from our mistakes. On a real patient, it’s not an option to slip up,” the 22-year-old said. The 3D models cost less than preserved organs, so students can handle the former without worrying about damaging them, said the school’s head of anatomy Prof Mogali. According to a NTU spokesperson, 3D-printed models cost about a tenth of a preserved one. Moving forward, LKCMedicine said in a press release that it is working to improve the printing technology so that specimens will touch and feel like real flesh tissues. For Phua, this is an exciting prospect. “For now, we practice performing injections on arm models that are made of sponge-like material that doesn't feel very natural,” he said.